As the sun comes out and hemlines rise, thoughts often turn to legs. Few women who have reached their thirties are lucky enough to have the flawless skin of youth. Time and childbearing frequently conspire to mar an otherwise shapely calf with spider veins, or the blue bulging knots of a larger, varicose vein. Abnormal veins are not just a cosmetic issue – the swollen, tense varicosities can make legs feel heavy and symptoms of throbbing and aching are commonplace – especially for people required to stand up for long periods of the day. Untreated over the long term, varicose veins can damage the skin around the ankle, leading to itching, irritation and eventually even the dreaded venous ulcer, an open sore over the leg which is difficult to heal. This is a major cause of pain and misery for older people. While older people will not necessarily go on to develop a venous ulcer, age is one of the main risk factors for varicose veins. Family history is also an indicator that someone may suffer from varicose veins. There is an increasing amount of research suggesting there are specific genetic markers which lead to the abnormal development of venous valves. Gender also plays a part, as women tend to get varicose veins more often than men. Hormonal changes which occur during puberty, pregnancy and menopause, along with use of birth control pills and HRT therapy could raise a woman’s risk. Being overweight can also put extra pressure on the veins, as can a lack of movement. Standing or sitting for a long time can force your veins to work harder to pump blood to your heart, while previous blood clots or traumatic damage to the valves in your veins could affect their ability to move blood back to the heart, so increasing the risk of varicose veins. 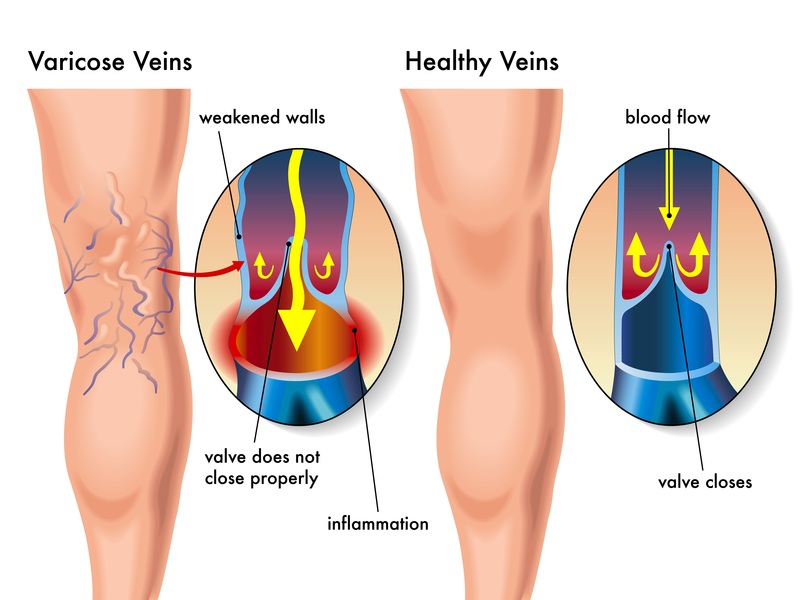 When they do occur, there are three basic reasons to treat varicose veins; to make the leg look better, to make it feel better and to prevent later deterioration in the skin quality at the ankle, and the development of an ulcer on the leg. Despite these compelling reasons, many people chose to ignore their veins for fear of painful surgery. Yet treatment for veins is now easily accessible and successful , more so than at any time in the last century. Minimally invasive techniques such as EVLT lasering and RF ablation have revolutionised the landscape, so that the majority of veins can be permanently fixed by a 30-minute operation, conducted under local anaesthetic. The days of the ‘high tie and strip’ open surgical operation, with a mandatory general anaesthetic and a high rate of recurrence should be firmly in the past. National Institute for Health and Care Excellence (NICE)recommendations state this unequivocally, but still over 40% of vein operations in the UK are done by outdated open surgical methods. The severity of vein problems can be graded by doctors on a scale of 1 to 6. Grade 1 is a minor spider vein or thread vein, which is essentially a cosmetic blemish. Grade 2 veins are small veins that bulge but don’t cause any aching or discomfort, while grade 3 veins are larger and uncomfortable. Grade 4 veins are bigger still with complications in the skin such as itching and dryness. Grade 5 shows skin damage progressing to discolouration of the skin by a brown ‘staining’ at the ankle and grade 6 is a full blown venous ulcer or skin breakdown to an open sore. The decision to seek treatment for vein problems often relates to the degree of severity listed above. The urgency of treatment relates to that severity; if veins are grade 3 or above, then treatment is important to prevent both symptoms and the inevitable progression to an ulcer. Grades 1 and 2 are more ‘optional’ as far as surgery is concerned and can often be treated with simple techniques such as injection sclerotherapy. Whatever the severity of your vein problem, consultation with a vein specialist is important in achieving a good outcome. Proper assessment and ultrasound scanning followed by consideration of the best treatment option gives the best chance of a durable, successful and cosmetically attractive result. It does not have any sulfates or oxybenzone or any such harmful chemicals. product is triclosan. This category of anti aging skin care products is related to anti-oxidants. Great read! Thanks for your thoughts on varicose veins and the issues they can bring about. My nephew has varicose legs which were making him anxious and unable to sleep through the night.I bought venorid for him.Now he’s feeling back to normal and getting his daily routine life. He is the one happy now!!!!!!! !